Remember The Call of Cthulhu from 2005? The black & white very successful adaption produced by The H.P. Lovecraft Historical Society. This is still one of the best movie adaption of Lovecraft ever made, and I’m sure I’m not alone looking forward to their next production, The Whisperer in the Darkness. But until then, get you dirty little hands on Die Farbe, a very impressive and ambitious German production which rivals the title of the best Lovecraft film ever made. Not a movie for everyone, and the competition regarding good Lovecraft films isn’t that big actually, so if you don’t agree with me it’s OK. Die Farbe is based on the short story The Colour Out of Space from 1927, but it was a long time since I read it and I can’t really comment on the similarities. After reading a couple of summaries of the original story it seem like Die Farbe is very faithful to the source material, but instead of Massachusetts the story is to a big part moved to Germany and a young man and his search for his lost father in the area affected by “the color”. The color yeah, it comes from a meteorite and is spreading and poisoning the people and nature in the area, slowly killing everything, stealing the energy from everything alive around it. Could this be the first story about a meteorite creating havoc in a small town? Director and screenwriter Huan Vu goes a whole different route here compared both to productions of the Lovecraft society and older adaptations of the Lovecraft’s work. Die Farbe is also in black & white, but has a very different pacing and idea about telling the story than I’ve seen before. Gone is the goofy monsters and charming b-movie feeling, Die Farbe is a slow and atmospheric horror/sci-fi flick with stunningly beautiful photo and a very European way of storytelling. Not fast editing, no direct action, just dread and death. I think the choice of making the movie in black & white can be because of two reasons: it looks good and it fits the time when the movie is set to be, but also it makes the use of the color very effective. Because when the color from outer space appears it’s also the only thing in color. The visual effects are very good and never disturb the story by being cheesy or annoying. Overall the acting is good, even if many of the actors are amateurs. The gorgeous landscapes and nature – even if it’s in black & white – is fantastic to watch. I wish I had a house there! 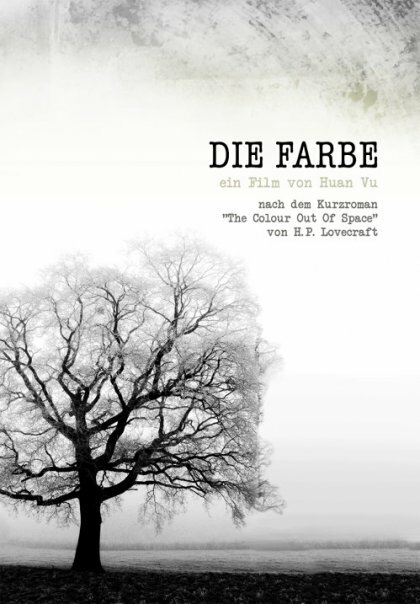 It’s hard to describe Die Farbe, but I can recommend it to anyone interested in Lovecraft and brilliant indie filmmaking. This is as far from SOV cheesiness as possible, this is a real movie and a real story. I bough the BD from the official homepage, and it’s also available on DVD. I’m sure most of you would appreciate this fantastic-looking visual delight, so go get it! This sounds amazing and one of many reminders for me to finally see The Call of Cthulhu, it's been collecting dust amongst my dvds far too long now! Maybe make it a double feature night together with Die Farbe!